Get your kids off to the perfect start in their educational lives. Teach your toddlers in the smartest way and enhance their learning, even before they start going to school. 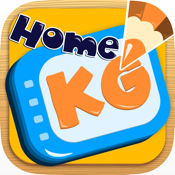 Home KG is an amazing free learning app that helps you teach preschoolers and elementary school children how to write letters and numbers in a fun way. Home KG helps children of ages 3-5 in learning to recognize basic shapes and objects, tracing letters and alphabets, writing number, enhances their drawing and coloring skills and recognizing the sounds of alphabets and words, thereby setting a firm base for their school education. Using Home KG, your toddlers get well prepared for their school lives. With an interactive interface that your toddlers will find highly engaging, Home KG is simply the best preschool learning tool for your toddlers. To make learning more interactive for kids, Stella guides your children through their learning process, leading and encouraging them along the way. Your kids get to see eye-catching images of all the alphabets to develop a recognition process of letters in their minds. Your child can trace the letters making it easier for parents to teach them all the basics without using paper and pencil. To make sure that your child is progressing, you can take a snapshot and make a video of your child’s learning process. Being a smart learning tool for preschool children, the interface of Home KG is kept simple yet interactive. It incorporates engaging music and cool animations in the backdrop. The app tries to ensure that your child’s learning experience is fun, simple and engaging. Home KG simply makes learning easy and fun, making it one of the best educational apps for toddlers. Get your hands on this great app for free, and teach your child all the preschool basics in a fun way.